"We could be New York good, just being here." Rebecca Wood did not set out to be a potter. She was, however, born to be an artist. Raised in Atlanta, she was just 60 miles but a world away from the Athens scene she found when she arrived at the University of Georgia&apos;s art school in 1975. Rebecca was in Athens at a seminal moment. "We had no money, no car, no phone. All we had was free time to hang around and be creative," Rebecca recalls. She, and other art students, witnessed the B-52s skyrocket to fame. Though that band departed for New York City, Rebecca was among a generation of young Athens creatives who experienced the B-52s success reflecting back upon Athens. The prevailing spirit, Rebecca says, was "we could be New York good, just being here." That can-do attitude had a giant ripple effect on the music and arts community that has lasted well into a new century and can be seen throughout Athens in local art studios and as a continued hotbed for live music. After graduating from the University of Georgia, Rebecca became a working artist, with a focus on painting still lifes in oil. Her inspiration, then and today, was found in nature, and she had many successful solo exhibitions. 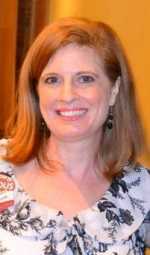 Creative and financial considerations led her to expand into new forms of art, including designing and painting furniture, textiles, jewelry, and other household items. She then ventured into china painting, but soon realized that the traditional process of glaze on china was not achieving her desired effect. 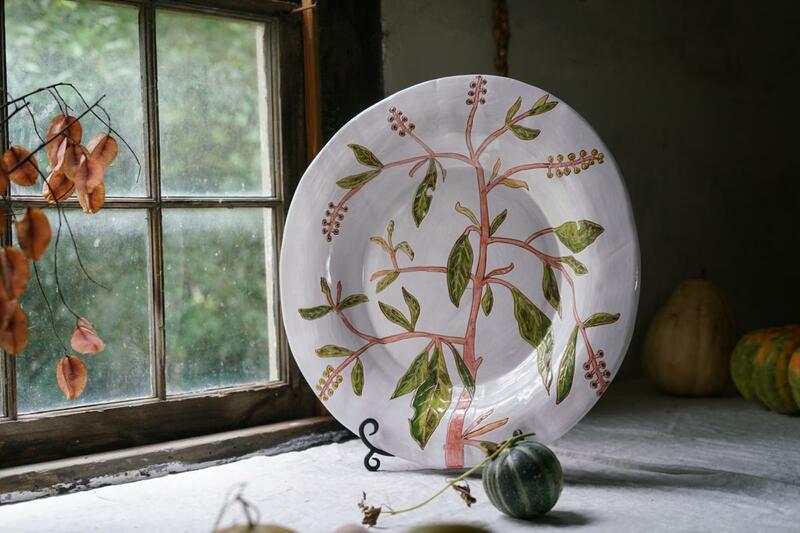 Not one to back down from a challenge, Rebecca proceeded to create her own technique for producing ceramics that were both beautiful and durable. R.Wood Studio and Beauty Everyday were born. Rebecca&apos;s creations have translated her painting techniques and themes of color and nature into her pottery. Rebecca Wood uses a low-fire technique, which allows her to draw patterns, then develop colors through a series of paints and glazes. The resulting pieces are both beautiful and sturdy enough for everyday use. 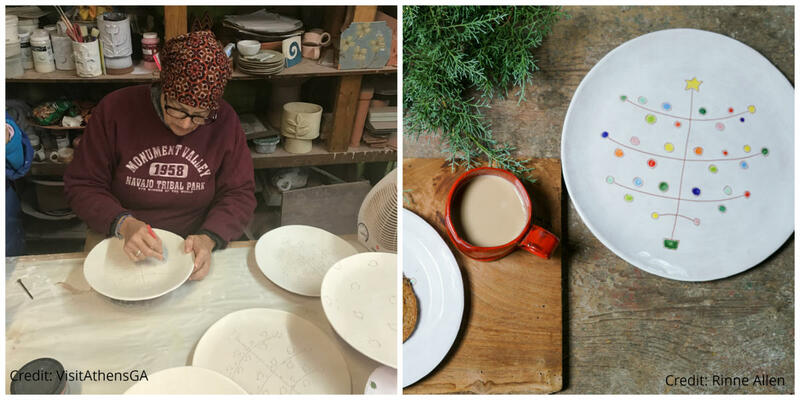 Above, left, Rebecca draws her 2018 holiday pattern on plates, which when painted, glazed and fired become youthful and fun (right). "Ever tempted to leave Athens? Never." When asked whether she was ever tempted to leave Athens, Rebecca replies: "Never. I can drive five minutes and be on a dirt road. I am closer to nature here." Nature and color continue to inspire her. She heads to the State Botanical Garden of Georgia, the Georgia Museum of Art, and other local museums and galleries, all right here in Athens. She&apos;s not just close to nature in Athens, but also to a strong and still-growing community of artists and makers. "There are so many good potters around here it&apos;s not even funny," Rebecca says. 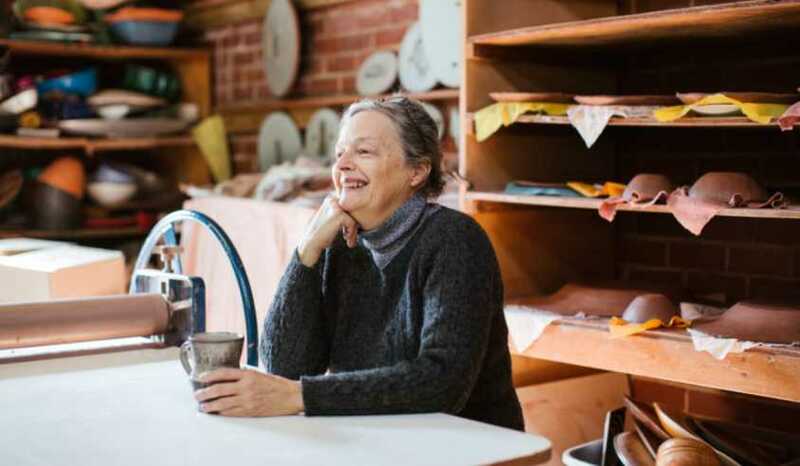 She recommends checking out Maria Dondero at Southern Star Studio and Juana Grecco&apos;s usable tabletop ceramics, as well as Nancy Green. Today, Rebecca says she has the "best job on Earth." 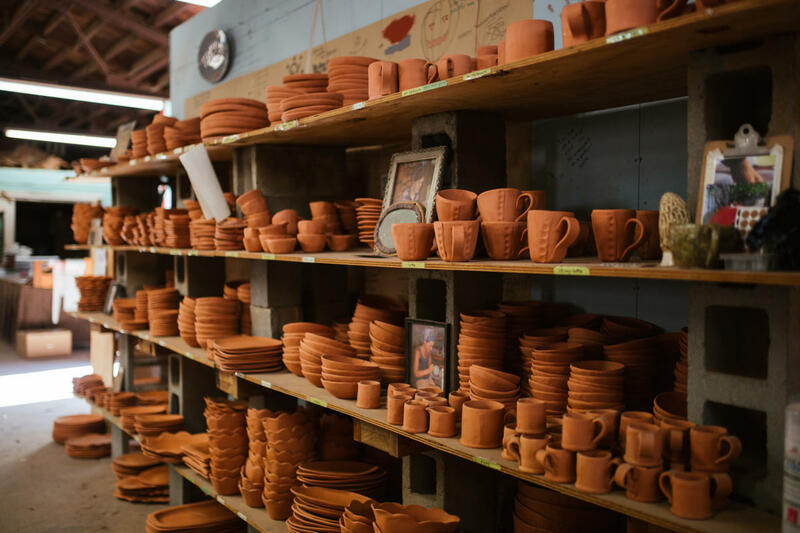 She employs many potters and has assistants to manage the store, which she says "leaves me to do the creative work." She travels a few times a year to New York City to exhibit to buyers at gift shows, but is happily centered in Athens the rest of the year. Inspired by Rebecca Wood? 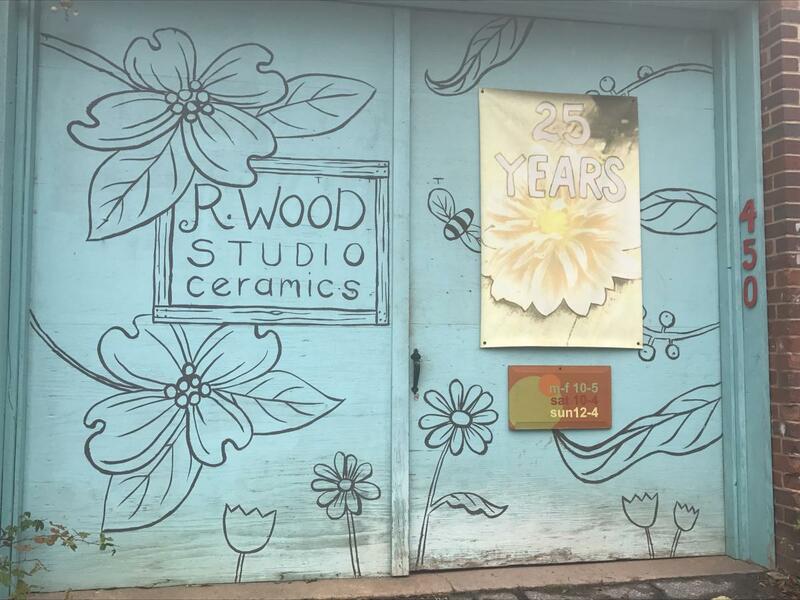 Visitors to Athens can visit R.Wood Studio and watch the potters at work, who are happy to answer questions and explain more about their process. Groups of 10 or more need only to call ahead to ask for a guided tour from Rebecca. The studio is open Monday-Friday from 10 - 5, Saturday from 10-4, and Sunday 12-4. You&apos;ll love to shop and see the lovely pieces in progress, then take home your favorites with you. R.Wood provides shipping and plenty of online options and made-to-order as well. Header photo, courtesy of Kristin Karch. Other photos credited to VisitAthensGA.com unless otherwise indicated.